在我涉入 Software GUI 的研究領域之初, 我所思考的第一個問題其實是跟 Software User Interface Copy 有關的問題. 當時的觀察對象是 XMMS 跟 Winamp, 以及其他在 Desktop Linux 上跟已經在 Windows 上存在已久的 softwares 之間極為相似的 GUI 設計. 當時的想法是希望探討 GUI 的設計模仿跟 OSS 的成功之間是否存在關係, 以及是否 OSS 可以在發展初期藉由模仿既有的 popular software GUI 設計, 取得較大的成功優勢. 當然這背後還牽涉到怎樣把 functionality 跟 non-functionality 的 GUI 連結起來並從整個 global software 身上分離的問題, 這在目前也還沒有具體的研究成果. 不過這個想法最終是死在對於智慧財產權的考量. 因此雖然我還是在嘗試解決相關的問題, 但是採用的是完全不同的做法. 這樣的模仿, 目的之一當然是希望能夠混淆視聽, 讓使用者分不出來這是 Linux 還是 Windows Vista, 以達到想要的結果, 也就是寫在 Vixta Goals 裡的 : Spread linux to the "masses", User-Friendly, 以及 Familiar look and Feel. 假設 Vixta 可以達到他想要的效果好了, 這意味著使用者無法在使用 Vixta 時分清楚究竟現在他用的是 Linux 系統還是 Windows 系統, 要達到這個程度, 不是只改改 layout 介面就可以作到的. Software GUI 的真正意涵在於連接 Software 的運作邏輯 (Software Implementation Model) 與 User 的使用邏輯 (User's Conceptual Model) , 而通常後者的可變動性 (flexibility) 是比較大的, 因此可以說 Software GUI 是決定了怎樣把 Software 的運作邏輯表現給 User, 使得 User 可以在最小修正使用邏輯的前提下, 最有效率地利用該 Software. 而如果今天出現了一個 Software GUI, 可以讓 User 察覺不到背後的系統更換, 那麼被更換的兩個系統, 與 Software GUI 之間必定有相當程度的 decoupling -- 換句話說, 在 Software GUI 與背後的系統之間有相當清楚的 Interface 存在. 圖中的 Implementation Model 是同時包含了 hardware 以及 software 的部分. 可以看的出來各部分之間的 coupling 關係, 使得要完成一個完整的 Software User Interface Copy 是很難的事情, 因為多多少少不同的系統在 Implementation Model 上都有差異, 也會影響到 Presentation Language 以及 Action Language 的呈現. 如果為了 Copy 而去改變 Implementation Model 就有點本末倒置了. 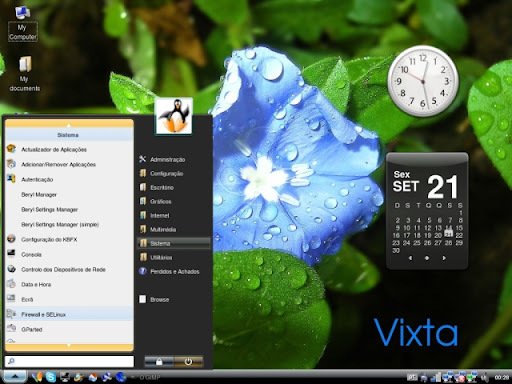 我相信 Vixta 總不會為了要讓 User Interface 更像 Vista 一點而去改 Linux 系統本身吧. 但是這是不是意味著 Software User Interface Separation (from Functional Application Part) 是不可能的呢 ? 我覺得倒也未必, 只是可能不會由目前的模仿之路作到, 而是透過 UI Design Patterns 的路作到. 重點還是在於 User 是否需要這樣的東西. 這下好了, 用 Linux 的人在用 Windows 的 Desktop, 用 Windows 的人改用 Mac 的 Desktop, 下一個會是誰用誰的呢 ? 但是可以肯定的是, 只要 User 有這樣需求的一天, User Interface Separation 的可能性就一直存在, 差別可能只在於會在哪出現, 是在 OS 上, 還是會率先在 Web Applications 上出現呢 ? 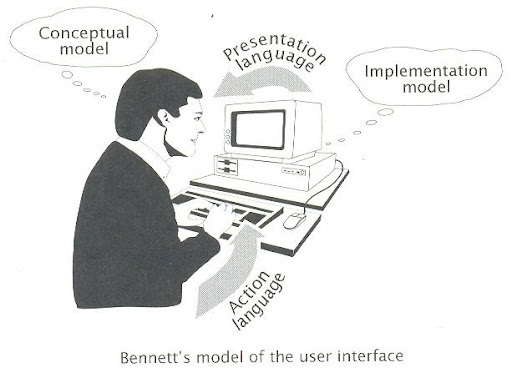 Theo Mandel, The Elements of User Interface Design, Wiley, 1997. This entry was posted on 上午10:12 and is filed under linux , software gui , web engineering . You can follow any responses to this entry through the RSS 2.0 feed. You can leave a response, or trackback from your own site.